Geranium – beautiful flower, lovely fragrance (some are called rose geranium for their scent), its essential oil is great for the skin and bodily functions. Sounds like a true lady: beautiful inside and outside! All the ladies who have suffered from menstrual cramp will be able to identify with how I feel about the substance that relieved that awful, nauseating, debilitating tightness in the lower abdomen during the time of the month when you already have to deal with the other troubles of the period. Yes, I’m in love with the geranium essential oil which took away the cramp so swiftly, left me smelling like a flower and uplifted my mood a few days ago! The geranium is a genus of 422 species of flowering annual, biennial and perennial plants. The picture above shows some of the common ones. You should have seen a few of them before? Not all geraniums produce enough essential oils to be extracted. 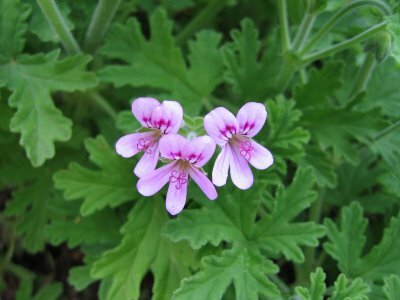 The geranium essential oil comes from the specie pelargonium graveolens, pictured below. It is sometimes called the rose geranium because of its similar fragrance too the rose. For the same reason, it is used as a cheaper substitute for the rose essential oil to perfume soaps and cosmetics. The Young Living Geranium essential oil is steam-distilled from the flowers and leaves. Geranium has been used for centuries for regenerating and healing skin conditions. Its medical properties include antispasmodic, antioxidant, antitumoral, anti-inflammatory, anticancer, hemostatic (stops bleeding), antibacterial, antifungal, improves blood flow, liver and pancreas stimulant, dilates bile ducts for liver detoxification, helps cleanse oily skin; revitalizes skin cells. It can be used to support hepatitis/fatty liver, skin conditions (dermatitis, eczema, psoriasis, acne, vitiligo), fungal infections (ringworm), viral infections (herpes, shingles), hormone imbalances, circulatory, menstrual problems/PMS. A search on PubMed, an online portal of the US National Library of Medicine of research publication, listed 85 articles on geranium essential oil. I scanned the titles of the articles – there are articles on using geranium essential oil to repel ticks, as anti-inflammation treatment, to fight against bacteria, etc. Look here to read them all. I should state it here that PubMed is an awesome resource to search for research, tests and studies on essential oils. Although many people claim that no studies have proven the effectiveness of essential oils as an alternative to medicine, there are indeed numerous studies done to prove these people wrong. Type in “essential oils” or the specific oil in the search bar. I found many tests on using essential oils against MRSA even. 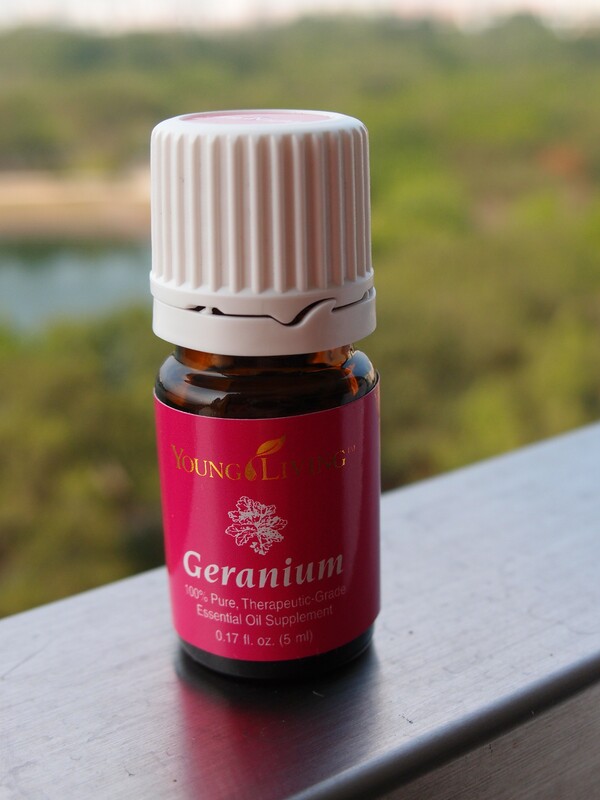 Geranium is found in many Young Living essential oil blends and personal care products. 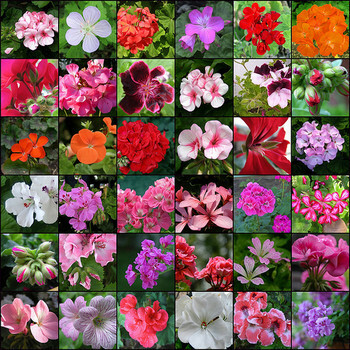 It is too many for me to list them all here but if the product smells sweet, chances are that it has geranium! Besides the properties listed earlier, its fragrance is uplifting and can ease nervous tension. It’s in some of my favourite blends like Awaken, Believe, Clarity, Gentle Baby, Harmony, Jpy, Lady Sclareol and White Angelica. It’s also in A.R.T. Renewal Serum, Copaiba Vanilla Moisturizing Shampoo and Conditioner, KidScents Bath Gel and Lotion. Apply 1-2 drops on lower abdomen to relieve menstrual pain. You can mix 5 drops of it with 5 drops of Cypress, 8 drops of Patchouli and 1 drop of Sandalwood into a bottle to make a skin-firming rub for the tummy – kill 2 birds with 1 stone! Add a few drops to a spray bottle of distilled or purified water to make a refreshing facial spray. Add other essential oils that are great for the skin like frankincense, sandalwood, rose, patchouli, lavender as desired. Works as a hydrating spray on flights and in dry climates too. 1 drop with a pump of V6 oil or other carrier oil or the A.R.T Night Reconstructor and used as a face moisturizer in the evening. My skin tone was visibly brightened after a few applications. A dab behind the ears as perfume – uplifting and sweet to the senses. Add to the Young Living Bath and Shower Gel Base. Diffuse around the house to uplift everyone’s mood! A friend brings along her Geranium and almond oil for her body massages at the spa. Tell me how else you use Geranium for!